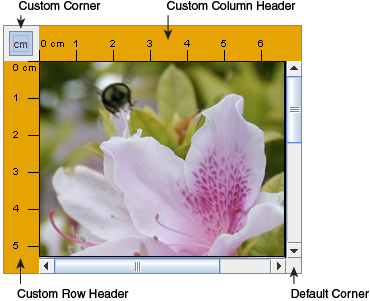 A JScrollPane provides a scrollable view of a component. When screen real estate is limited, use a scroll pane to display a component that is large or one whose size can change dynamically. Other containers used to save screen space include split panes and tabbed panes. The boldface line of code creates the JScrollPane, specifying the text area as the scroll pane's client. The program doesn't invoke any methods on the JScrollPane object, since the scroll pane handles everything automatically: creating the scroll bars when necessary, redrawing the client when the user moves the scroll knobs, and so on. You might have noticed that the preceding code sets the preferred size of the scroll pane's container. In the Java look and feel, this preferred size happens to be a bit less tall than required for the text area to display the 5 rows that we requested when creating it, so the scroll bar initially displays a vertical scroll bar. If we didn't restrict the size of the scroll pane's container, the scroll pane would be big enough for the text area to display the full 5 rows and 30 columns specified with the JTextArea constructor. Refer to Sizing a Scroll Pane for information about techniques for making a scroll pane the size you want. The scroll pane in this application looks very different from the one in the previous demo program. Rather than displaying text, this scroll pane contains a image. The scroll pane also has two scroll bars, a row header, a column header, and four corners, three of which have been customized. Click the Launch button to run ScrollDemo using Java™ Web Start (download JDK 7 or later). Alternatively, to compile and run the example yourself, consult the example index. Move the knobs on the scroll bars. Watch the image scroll and the horizontal and vertical rulers scroll along. If you have a mouse with a wheel (which is generally between the mouse buttons) use the mouse wheel to scroll the image vertically. Click the cm toggle in the upper left corner of the scroll pane. The units on the row and column headers change to inches (or back to centimeters). Click the arrow buttons on the scroll bars. Also, try clicking on the track above or below the knob on the vertical scroll bar, or to the left or right of the horizontal one. Move the cursor over the image and press the cursor. Continuing to press the cursor, drag to a point outside the image and pause. The visible area of the image moves toward the cursor. This scroll-by-dragging functionality is enabled by the scroll pane, and with the JComponent API, but it is implemented by the custom component that displays the image. Resize the window. Notice that the scroll bars disappear when the scroll pane is large enough to display the entire image and reappear again when the scroll pane is too small to show the entire image. The scroll pane's client is also known as the view or viewport view. You can change the client dynamically by calling the setViewportView method. Note that JScrollPane has no corresponding getViewportView method. If you need to refer to the client object again, you can either cache it in a variable or invoke getViewport().getViewportView() on the scroll pane. 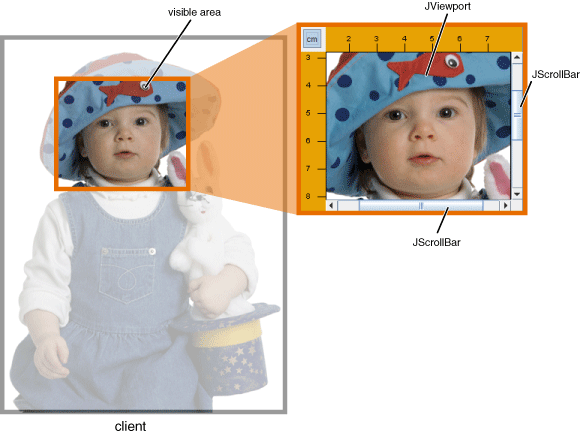 A scroll pane uses a JViewport instance to manage the visible area of the client. The viewport is responsible for positioning and sizing the client, based on the positions of the scroll bars, and displaying it. A scroll pane may use two separate instances of JScrollBar for the scroll bars. The scroll bars provide the interface for the user to manipulate the visible area. The following figure shows the three areas of a scroll bar: the knob (sometimes called the thumb), the (arrow) buttons, and the track. When the user moves the knob on the vertical scroll bar up and down, the visible area of the client moves up and down. Similarly, when the user moves the knob on the horizontal scroll bar to the right and left, the visible area of the client moves back and forth accordingly. The position of the knob relative to its track is proportionally equal to the position of the visible area relative to the client. In the Java look and feel and some others, the size of the knob gives a visual clue as to how much of the client is visible. By clicking an arrow button, the user can scroll by a unit increment. By clicking within the track, the user can scroll by a block increment. If the user has a mouse with a wheel, then the user can scroll vertically using the mouse wheel. The amount that the mouse wheel scrolls is platform dependent. For example, by default on Windows XP, the mouse wheel scrolls three unit increments; the Mouse control panel allows you to specify a different number of unit increments or to use a block increment instead. More information about unit and block increments is in Implementing a Scrolling-Savvy Client. Typical programs don't directly instantiate or call methods on a viewport or scroll bar. Instead, programs achieve their scrolling behavior using the JScrollPane API and the API discussed in Implementing a Scrolling-Savvy Client. Some scrolling-savvy components such as JList, JTable, and JTree also provide additional API to help you affect their scrolling behavior. On startup, the scroll pane in the ScrollDemo application has two scroll bars. If you make the window large, both scroll bars disappear because they are no longer needed. If you then shrink the height of the window without changing its width, the vertical scroll bar reappears. Further experimentation will show that in this application both scroll bars disappear and reappear as needed. This behavior is controlled by the scroll pane's scroll bar policy, Actually, it's two policies: each scroll bar has its own. ScrollDemo doesn't explicitly set the scroll pane's scroll bar policies  it uses the default. You can set the policies when you create the scroll pane or change them dynamically. HORIZONTAL_SCROLLBAR_AS_NEEDED The default. The scroll bar appears when the viewport is smaller than the client and disappears when the viewport is larger than the client. HORIZONTAL_SCROLLBAR_ALWAYS Always display the scroll bar. The knob disappears if the viewport is large enough to show the whole client. HORIZONTAL_SCROLLBAR_NEVER Never display the scroll bar. Use this option if you don't want the user to directly control what part of the client is shown, or if you want them to use only non-scroll-bar techniques (such as dragging). The area drawn by a scroll pane consists of up to nine parts: the center, four sides, and four corners. The center is the only component that is always present in all scroll panes. Besides scroll bars, the sides can contain column and row headers. A corner component is visible only if both sides that intersect at that corner contain visible components. 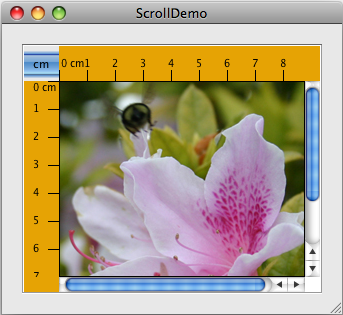 As shown in the figure, the scroll pane in ScrollDemo has custom row and column headers. Additionally, because all four sides are populated, all four corners are present. The program customizes three of the corners  two just fill their area with the same color as the Rules, and the other contains a toggle button. The fourth corner, the lower right corner, is the default provided by the scroll pane. Notice that because the row and column headers are always present in this example, the toggle button is also always present. If a corner contains a control that the user needs access to all the time, make sure the sides that intersect at the corner are always present. For example, if this application placed the toggle in the lower right corner where the scroll bars intersect, then the toggle would disappear if the user resized the window and even one of the scroll bars disappeared. //Create the row and column headers. You can use any component for a scroll pane's row and column headers. The scroll pane puts the row and column headers in JViewPorts of their own. Thus, when scrolling horizontally, the column header follows along, and when scrolling vertically, the row header follows along. Make sure the row and column have the same width and height as the view, because JScrollPane does not enforce these values to have the same size. If one differs from the other, you are likely to not get the desired behavior. As a JComponent subclass, our custom Rule class puts its rendering code in its paintComponent method. The Rule rendering code takes care to draw only within the current clipping bounds, to ensure speedy scrolling. Your custom row and column headers should do the same. Remember that the size of each corner is determined by the size of the sides intersecting there. For some components you must take care that the specific instance of the component fits in its corner. For example, the program sets the font and margins on the toggle button so that it fits within the space established by the headers. It's not an issue with the Corner class because that class colors its entire bounds, whatever they happen to be, with a solid color. The constants are defined in the ScrollPaneConstants interface, which JScrollPane implements. To customize the way that a client component interacts with its scroll pane, you can make the component implement the Scrollable interface. By implementing Scrollable, a client can specify both the size of the viewport used to view it and the amount to scroll for clicks on the different controls on a scroll bar. You can also specify if the view should track the size of the viewport. This is typically used when the viewport is bigger than the view, but the view should fill the available space. Here again are the three control areas of a scroll bar: the knob, the buttons, and the track. You might have noticed when manipulating the scroll bars in ScrollDemo that clicking the buttons scrolls the image to a tick boundary. You might also have noticed that clicking in the track scrolls the picture by a "screenful". More generally, the button scrolls the visible area by a unit increment and the track scrolls the visible area by a block increment. The behavior you see in the example is not the scroll pane's default behavior, but is specified by the client in its implementation of the Scrollable interface. ScrollablePicture implements the Scrollable interface primarily to affect the unit and block increments. However, it must provide implementations for all five methods. Thus, it provides reasonable defaults for the other three methods that you might want to copy for your scrolling-savvy classes. //and the nearest tick mark in the indicated direction. If the image is already on a tick mark boundary, this method returns the number of pixels between ticks. Otherwise, it returns the number of pixels from the current location to the nearest tick. This method returns the height of the visible rectangle minus a tick mark. This behavior is typical, but true if scrolling vertically, otherwise, it's the width.A block increment should be slightly smaller than the viewport to leave a little of the previous visible area for context. For example, a text area might leave one or two lines of text for context and a table might leave a row or column (depending on the scroll direction). //The user is dragging us, so scroll! This snippet scrolls the picture whenever the user drags from the picture to a location outside the picture and pauses. The setAutoscrolls method is defined by JComponent for the purpose of assisting  but not implementing  scrolling by dragging. Setting the autoscrolls property to true makes the component fire synthetic mouse-dragged events even when the mouse isn't moving (because it stopped, mid-drag, outside the component). It's up to the component's mouse motion listener to listen for these events and react accordingly. Unless you explicitly set a scroll pane's preferred size, the scroll pane computes it based on the preferred size of its nine components (the viewport, and, if present, the two scroll bars, the row and column headers, and the four corners). The largest factor, and the one most programmers care about, is the size of the viewport used to display the client. If the client is not scrolling-savvy, then the scroll pane sizes itself so that the client displays at its preferred size. For typical unsavvy clients, this makes the scroll pane redundant. That is, the scroll pane has no scroll bars because the client's preferred size is big enough to display the entire client. In this case, if the client doesn't change size dynamically, you should probably limit the size of the scroll pane by setting its preferred size or the preferred size of its container. If the client is scrolling-savvy, then the scroll pane uses the value returned by the client's getPreferredScrollableViewportSize method to compute the size of its viewport. Implementations of this method generally report a preferred size for scrolling that's smaller than the component's standard preferred size. For example, by default, the value returned by JList's implementation of getPreferredScrollableViewportSize is just big enough to display eight rows. Scrolling-savvy classes, like lists, tables, text components, and trees, often provide one or more methods that let programmers affect the size returned from getPreferredScrollableViewportSize. For example, you can set the number of visible rows in a list or a tree by calling the setVisibleRowCount method. The list or tree takes care of figuring out the size needed to display that number of rows. Refer to Methods in Other Classes Related to Scrolling for information about scrolling-related methods provided by classes other than JScrollPane. And remember  if you don't like the value that getPreferredScrollableViewportSize returns, you can always set the preferred size of the scroll pane or its container. Changing the size of a scroll pane's client is a two-step process. First, set the client's preferred size. Then, call revalidate on the client to let the scroll pane know that it should update itself and its scroll bars. Let's look at an example. 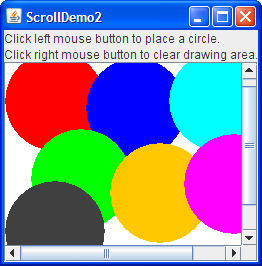 You can find the full source code for this example in ScrollDemo2.java, which is based on an example provided by tutorial reader John Vella. You can run ScrollDemo2 ( download JDK 7 or later). //gotten larger or smaller (if cleared). Note that when the client changes size, the scroll bars adjust. The scroll pane doesn't resize, nor does the viewport. Refer to SplitPaneDemo for another example in which the client object changes size. The following tables list the commonly used scroll-related constructors and methods. Other methods you are most likely to invoke on a JScrollPane object are those such as setPreferredSize that its superclasses provide. See The JComponent API for tables of commonly used inherited methods. JScrollPane(Component, int, int) Create a scroll pane. The Component parameter, when present, sets the scroll pane's client. The two int parameters, when present, set the vertical and horizontal scroll bar policies (respectively). void setViewportView(Component) Set the scroll pane's client. int getVerticalScrollBarPolicy() Set or get the vertical scroll policy. ScrollPaneConstants defines three values for specifying this policy: VERTICAL_SCROLLBAR_AS_NEEDED (the default), VERTICAL_SCROLLBAR_ALWAYS, and VERTICAL_SCROLLBAR_NEVER. int getHorizontalScrollBarPolicy() Set or get the horizontal scroll policy. ScrollPaneConstants defines three values for specifying this policy: HORIZONTAL_SCROLLBAR_AS_NEEDED (the default), HORIZONTAL_SCROLLBAR_ALWAYS, and HORIZONTAL_SCROLLBAR_NEVER. Border getViewportBorder() Set or get the border around the viewport.This is preferred over setting the border on the component. boolean isWheelScrollingEnabled() Set or get whether scrolling occurs in response to the mouse wheel. Mouse-wheel scrolling is enabled by default. void setRowHeaderView(Component) Set the column or row header for the scroll pane. Component getCorner(String) Set or get the corner specified. The int parameter specifies which corner and must be one of the following constants defined in ScrollPaneConstants: UPPER_LEFT_CORNER, UPPER_RIGHT_CORNER, LOWER_LEFT_CORNER, LOWER_RIGHT_CORNER, LOWER_LEADING_CORNER, LOWER_TRAILING_CORNER, UPPER_LEADING_CORNER, and UPPER_TRAILING_CORNER. (required by the Scrollable interface) Get the unit or block increment in pixels. The Rectangle parameter is the bounds of the currently visible rectangle. The first int parameter is either SwingConstants.HORIZONTAL or SwingConstants.VERTICAL depending on what scroll bar the user clicked on. The second int parameter indicates which direction to scroll. A value less than 0 indicates up or left. A value greater than 0 indicates down or right. (required by the Scrollable interface) Get the preferred size of the viewport. This allows the client to influence the size of the viewport in which it is displayed. If the viewport size is unimportant, implement this method to return getPreferredSize. (required by the Scrollable interface) Get whether the scroll pane should force the client to be the same width or height as the viewport. A return value of true from either of these methods effectively disallows horizontal or vertical scrolling (respectively). (in JComponent) Set whether synthetic mouse dragged events should be generated when the user drags the mouse outside of the component and stops; these events are necessary for scrolling by dragging. By default, the value is false, but many scrollable components such as JTable and custom components set the value to true. (in JComponent) If the component is in a container that supports scrolling, such as a scroll pane, then calling this method scrolls the scroll pane such that the specified rectangle is visible. (in JList) Set or get how many rows of the list are visible. The getPreferredScrollableViewportSize method uses the visible row count to compute its return value. (in JList) Scroll so that the row at the specified index is visible. This method calls scrollRectToVisible and works only if the list is in a container, such as a scroll pane, that supports scrolling. (in JTree) Set or get how many rows of the tree are visible. The getPreferredScrollableViewportSize method uses the visible row count to compute its return value. (in JTree) Scroll so that the specified tree path or row at the specified index is visible. These methods call scrollRectToVisible and work only if the tree is in a container, such as a scroll pane, that supports scrolling. (in JTree) Set or get whether scrolling occurs automatically when the user expands a node. True by default. This feature works only when the tree is in a container, such as a scroll pane, that supports scrolling. (in JTable) Set the value to be returned by getPreferredScrollableViewportSize. This table shows the examples that use JScrollPane and where those examples are described. How to Use Tool Bars Shows a simple, yet typical, use of a scroll pane. ScrollDemo This section Uses many of scroll pane's bells and whistles. ScrollDemo2 This section Shows how to change the client's size. How to Use Lists Puts a list and a label in a scroll pane. Also, shows how to handle the case when a scroll pane's client changes size. TableDemo How to Use Tables Puts a table in a scroll pane. TextSamplerDemo Using Text Components Puts a text area, an editor pane, and a text pane each in a scroll pane. TreeDemo How to Use Trees Puts a tree in a scroll pane. If you are programming in JavaFX, see Scroll Pane.